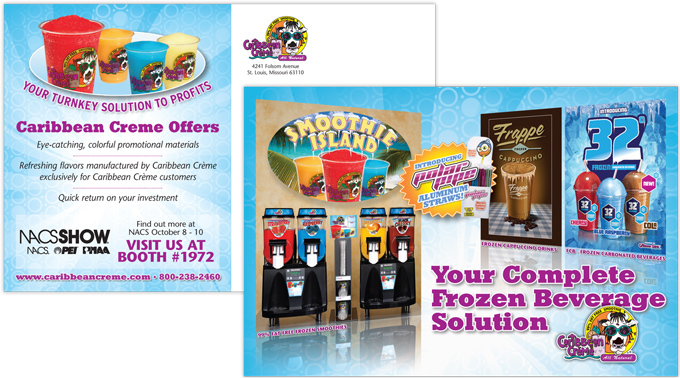 Caribbean Creme: Direct Mail Card - TriFecta Creative. Graphic Design and Creative Services for Your Business. Client needed to build excitement and awareness around their presence at a nation trade show. Utilizing product imagery we previously developed, we create a 6″ x 9″ direct mail piece in advance of the show. We completed all aspects of the project based on minimal initial direction from client. Needs were expressed in vague terms and we designed and developed multiple revisions and proofs based on continued communications. We brokered the final design for print production on a 14 pt coated stock with overall aqueous coating for that colorful, exciting impact the client desired.